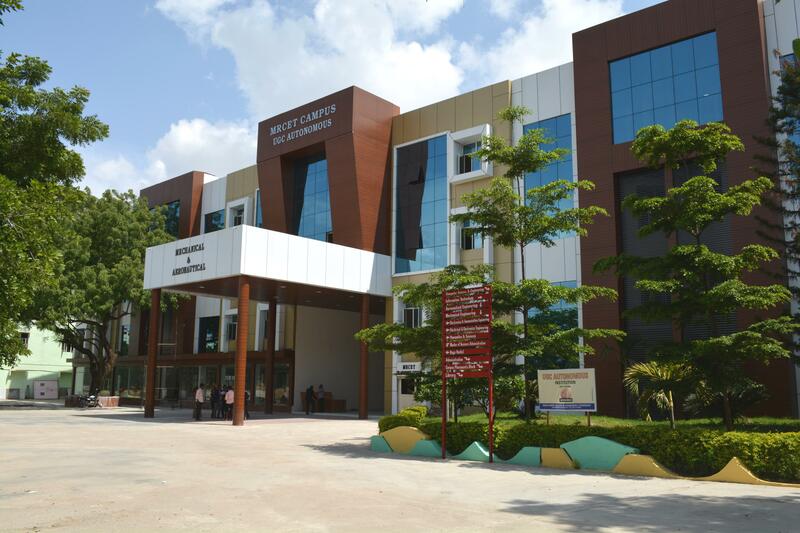 The department of Mechanical Engineering was established in MRCET in the year 2011 with an annual intake of 60 students, which has been increased to 120 from the academic year 2012 – 13 and to 180 in the academic year 2013 – 14. The Department of Mechanical Engineering played a leading role in evolving the “Engineering Science” based curriculum. Mechanical Engineering is of great importance in most contemporary technologies. Mechanical engineers work with machines and engines, from elevator technology to Robotics. Students can focus on areas such as heat transfer and fracture mechanics. Examples include Aerospace, Power generation and Conversion, fluid machinery, design and construction of mechanical systems, transportation, manufacturing, production, biomechanics and others. This wide range of applications is reflected in the three main stems of undergraduate curriculum thermal and fluid systems, mechanics and materials, and robotics and control systems. Engineering Mechanics is a more flexible program that enables students to pursue particular interests while centering on a smaller core of courses. We have been sanctioned Rs.30 lakhs for R & D projects under Research Promotion Scheme of AICTE. 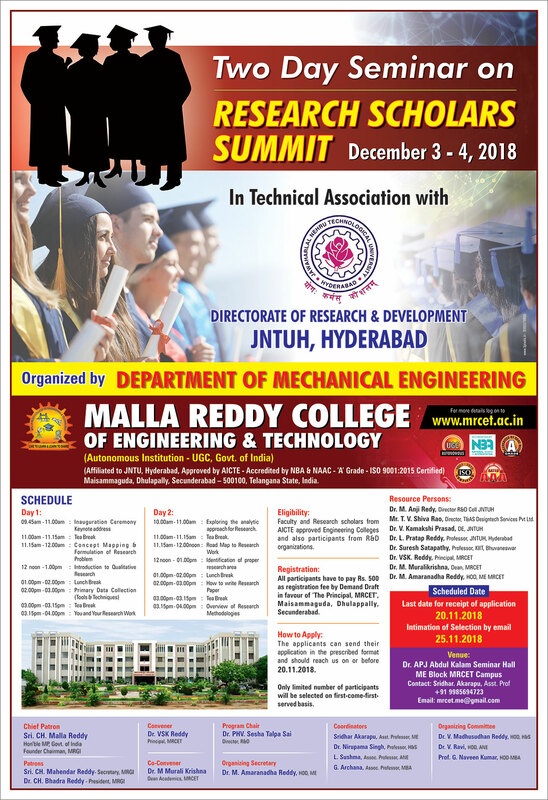 The Department is offering M.Tech courses in Machine Design & Thermal Engineering. The Department has been organizing Tec fest named YANTROTSAV every year and has also organized national level conferences named DISHA. Several faculty development workshops in the area of Design, Manufacturing, and Analysis were organized by the department. Further Department has successfully organized International conferences on Emerging Trends in Mechanical Sciences (ICEMS). Department has established several student forums/Chapters in various professional societies viz, SAE, IE, EWB and VIBHA .The Department has well established labs and well qualified and experienced faculty under the able guidance of professor P.H.V.SeshaTalpa Sai HOD,MECH. Faculty members encourage students to participate in both fundamental and applied research. Students have excellent opportunities to participate actively in classroom and laboratories and to follow special interests within the subject area. 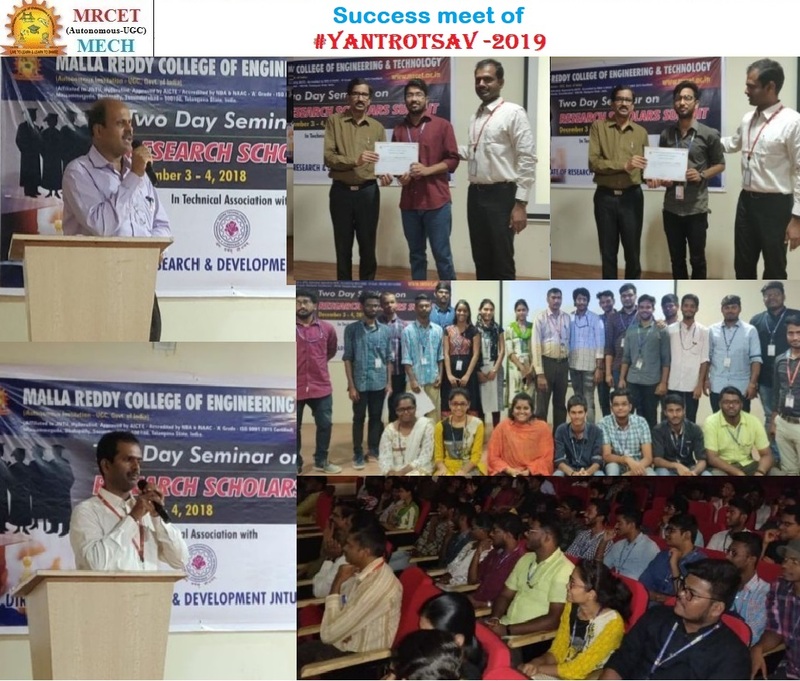 YANTROTSAV - 2019 on 09-03-2019 in APJ Abdul kalam Seminar hall in ME Block #MRCETCampusMech , #MRCET . 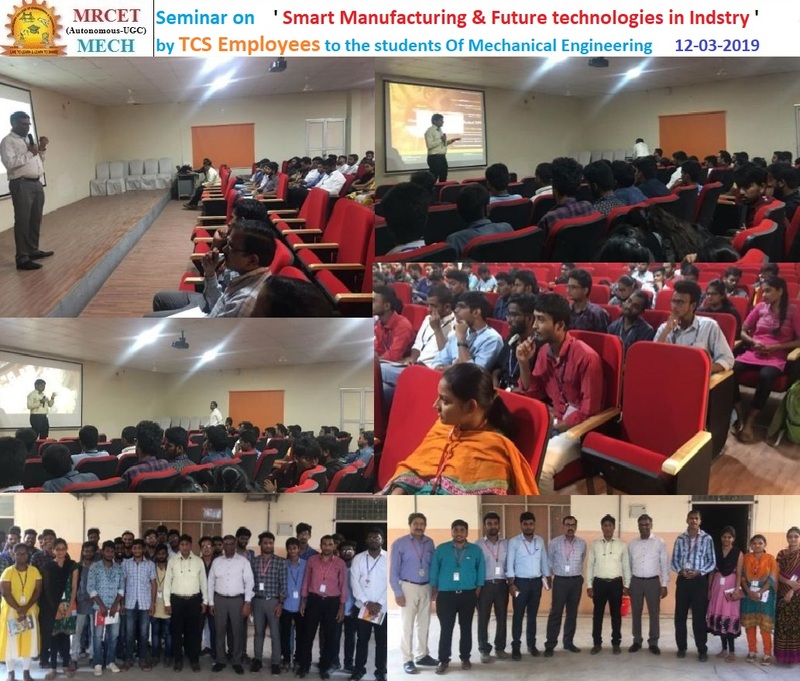 SMART MANUFACTURING & FUTURE TECHNOLOGIES in Industry By industry experts Of TCS Employees to the students of Mechanical engineering 12-03-2019 #MRCETCampusMech , #MRCET . 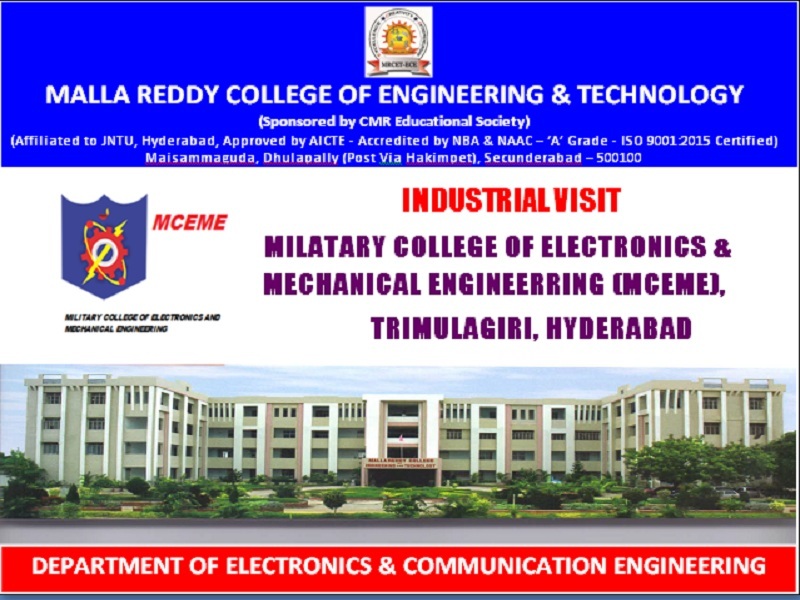 Industrial Visit to MCEME (Military College of Electronics and Mechanical Engineering) for III ECE students on 02-02-2019. A SPECIAL TRAINING ON " C LANGUAGE " TO ALL THE LATERAL ENTRY STUDENTS OF MRCET in ME Department #MRCETCampusMech, DURING 30 JANUARY TO 1st FEBUARY.-2019. A TWO DAY WORKSHOP ON CATIA V5 FOR II YEAR ME STUDENTS IS BEING ORGINIZED BY DEPTARMENT OF MECHANICAL ENGINEERING, MRCET, DURING 29th JANUARY TO 1st FEBUARY. Venue: Dr. APJ Abdul Kalam Seminar Hall . 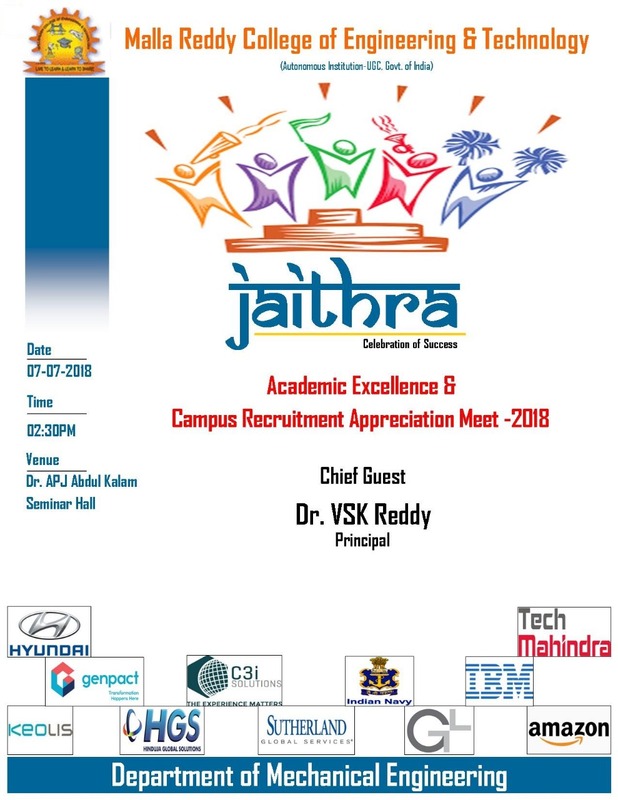 Academic Excellence and Campus Recruitment Appreciation Meet -2018.